Even though it’s a small town, there’s plenty to do to keep families busy and active. Browse this list for some of the opportunities in our town and the surrounding areas! Check back often, as we’re continually updating the list. Story and related crafts on the last Thursday of the month. The museum is also fun for an outing. Situated on Patterson Avenue, just beyond the new School of Business building, sits Dogwood Grove, a perfect picnic spot. The small pond is often home to many ducks, and just over the footbridge sits the Formal Gardens, full of flowers and plants. Right between Oxford and Hamilton on Old Oxford Road, this is a great playground. Wear closed-toe shoes, though, since the surface is shredded tires. A little gem hidden in Upham Hall, there is a large room full of specimens and displays to explore. Just down the hall there is a room for play where you can dress up in animal costumes and explore habitats. One of the few drive-in theatres around, this one has been in business for over 60 years. During the summer, the association offers a Junior Sailing Camp for kids ages 11 to 15, teaching the basics of sailing during a week-long camp. They also offer a “Learn to Sail Day” several times a year. This state park offers plenty of trails (some of them toddler-length) for hiking. They also offer camping, a beach, a golf course and equestrian trails. The Nature Center includes a small indoor display and an outdoor area with birds of prey and a few wild cats. On weekends they host various programs. Call the Nature Center, and they’ll send you a schedule of events, (513) 523-6347. Goggin offers skating classes for adults and children ages 3 and up and coordinates the Junior RedHawks hockey program. They also offer public skating on the weekends during the school year. Offering not only several weekly story hours, but also puppet shows, workshops and craft sessions. Based in Shideler Hall, there are more than enough rocks here to satisfy any junior geologist. Held on Mondays from 9:30-11:30am, children ages 6 and under and their siblings are invited to attend for free play. Activities range from large muscle activities to creative exploration. During the hot months of summer, we will have water activities available, so bring your child prepared to get wet if they choose! This museum has a permanent collection as well as special exhibitions. Admission is free, and there is a steady calendar of events, several for children. A great facility that offers group and private riding lessons for ages eight and up. Instruction for children ages 3 and up. Classes are taught by the Miami Women’s Gymnastics team. Miami’s campus and surrounding natural areas offer a vast number of walking trails. Trail maps are available for download. Check back with the website, as they occasionally offer guided hikes. The Rec Center offers swimming lessons, a climbing wall, and indoor gymnasiums for free play. The leisure pool is perfect for small children, as it has a graded entrance. Also keep an eye open for Family Fun Days, where they offer all kinds of great activities. Summer camps are also available. Tickets are available for purchase to Miami sporting events such as football, basketball, and hockey, but most other events are free! This program is designed to help team members learn and improve their climbing skills along with building confidence and tackling personal goals. As a group, the climbing team will focus on teamwork, building trust and communication within the group. The YCT coaches are Miami staff and students who are dedicated to teaching the sport of rock climbing. An ever-changing list of programs, primarily for school-age children. A health food store that specializes in local and hard-to-find goods. This is a great resource for those with food allergies or sensitivities. Currently offers art, music, dance, theatre, writing, and garden activities for adults and children. They also rent studios to artists, musicians, and writers at extremely reasonable rates. Held uptown on Saturday mornings. A great opportunity to buy local foods and socialize. They also offer the Sprouts program for kids, with new activities each week. Bowling isn’t just for the big kids! Even the youngest can participate, as every lane converts to bumper bowling and child-size balls are available for use. Adult and child classes, including a Tiny Dragons class that starts at age 3. Caretakers of several historical properties in Oxford, including the Pioneer Farm, the DeWitt Log Homestead, and the Black Covered Bridge. 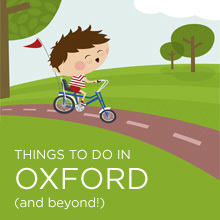 Visit these properties to learn more about historical Oxford. This is the city organization that facilitates the parks, swimming pool, and fitness facilities. They also coordinate special events and sports programs such as soccer, t-ball, tennis, field hockey, golf, track and field, swimming, diving, football, and basketball. Several of the youth programs accept children as young as four. Indoor free play in the winter for pre-schoolers. Date and time is typically announced at the end of September or beginning of October. A community soccer league for children ages 4 and up, emphasizing sportsmanship, competition, and fun! Coordinated by the Miami Art Department, this is a class held on Saturday mornings, taught by Miami Art Education students under the supervision of faculty. Classes range from age four to high school. Call the Art Department to be put on their email list, and they’ll contact you when they finalize session dates and times, (513) 529-2900. Held in the parking lot of Talawanda High School on Saturday mornings. A great opportunity to buy local foods and socialize. Little Muddlers, it’s all in the name – this preschool program will get your little one exploring the outdoors – water, bugs, dirt and all! All locations will be in the Oxford area and will be confirmed the week before the event. They also have a book club for adults. A paint-your-own pottery studio. In the summer, they offer camps for kids. Keep your eye on their schedule, as they often offer nights where they waive the studio fee! Just over the border, in Indiana, this 5,260 acre lake and surrounding park offers a beach, boating, fishing, hiking, and a playground. A 100 acre natural area whose mission is to promote the sustainable use of the earth’s resources through education, demonstration and research. Visitors can hike or participate in educational programs. An arts center located in nearby Hamilton that offers classes, exhibits, and performances. This 466 acre property provides nature related education through instruction, experiences and amenities. There are unique plant collections, rock and fossil collections, miles of hiking and running paths, and an auto tour. The arboretum is open free of charge to the public. Beautiful nature park with a huge treehouse for kids to climb in and lots of other fun spots. Each week there is a different science theme, and they have programs several times a day. If you think you’ll go more than once, buy the annual pass. G-rated movies that play at 10am on Saturdays and Sundays. The movie changes each month. The parks system that includes the entire county, which offers many events each month. Great playground and a wet “sprayground” that is great in the summer. This park also offers some fantastic paved bike paths. 100 acre demonstration farm. Cows, goats, pigs, etc. Also a great two-story indoor play area. Parky’s is part of Winton Woods, which also has a playground and “sprayground” and lake. An outdoor sculpture park. Periodically, they are host to puppet shows and other events, so it’s good to watch their calendar. A living history museum depicting life in Southwestern Ohio in the 19th Century, the village is home to many preserved buildings and equipment. Village interpreters demonstrate many of the historic tasks and crafts of the 19th century. From free festivals to arts scavenger hunts to choral showdowns, ArtsWave signature events give you the chance to experience arts from all across the Greater Cincinnati region. Nestled in beautiful Eden Park, this is a fantastic cultural outing. Their ever-growing collection is getting better and better, and thanks to a generous donation, admission is free! Designed to bring together all the arts and STEM programs for youth in the Greater Cincinnati region, Cincy Arts + STEM provides information for parents and teachers. Cincy Arts + Stem is a joint project of ArtsWave, the Greater Cincinnati STEM Collaborative, and the Greater Cincinnati Alliance for Arts Education. Use the search tool and find great after-school classes and activities, plus lots of summer and holiday camp options. You can also click on the Events and Activities tab above to find family-friendly arts, culture, and science events happening in our community. This is a perfect cultural outing for families, especially since the fourth floor houses the UnMuseum, a special floor just for kids. There are special exhibits where interaction is encouraged and a creative area where kids can draw and create. On the 2nd and 4th Thursday of each month, they offer Art Play for kids ages 3-7. Three museums in one building! There is a great Children’s Museum, with tons of activities. The Natural History Museum offers lots of science exhibits and offers a fantastic indoor sandbox. The Cincinnati Museum has historical exhibits of Cincinnati and the surrounding area as well as a model train replica of Cincinnati from the 1900’s to 1940’s. If you think you’ll go more than two times, a season pass is a great investment. Lots of great trails and a variety of programs for children. The Cincinnati Observatory is a fully functioning 19th-century observatory, home to one of the world’s oldest telescopes that is still in use. They offer year-round viewings which are open to the general public. A great outing with animals of every kind. In the winter, they decorate the whole zoo with lights and holiday gear. They also offer great summer camps! If you think you’ll go more than two times, a season pass is a great investment. A gorgeous park facility with flowers, ponds, and a children’s labyrinth. They offer many programs for children and adults, and are home to a native Butterfly House, which features native butterflies and moths. A program that uses drama, music and movement to engage children, teens, and adults of all abilities to reach their full creative potential while experiencing, creating and performing art. A 120-acre working and educational farm that offers farm visits, summer camps, and seasonal festivals and events. Building art awareness through fully interactive classes and projects, many classes offered free of charge! At the popular Toy Lab, create your own one-of-a-kind thingamajig from the massive selection of “recycled” toy parts. Set amongst 36 preserved acres of urban forest, Imago offers trails, educational programs, and summer camps. Educational opportunities range from science to Native America culture. Explore of 3,500 plant species at Krohn. Each spring, the ever-popular “Butterfly Show” arrives, where you can mingle among thousands of butterflies. Metamora is Indiana’s only functioning 1838 canal town. It offers shops, restaurants, events, and festivals. Many events, particularly the annual 1838 Days, have a historical theme, which include period clothing and demonstrations. A great aquarium with lots of exhibits and an indoor play area. If you have a stroller, call ahead. There are restrictions on strollers—on busy days, they aren’t allowed. If you think you’ll go more than two times, a season pass is a great investment. This working farm offers a fantastic, hands-on agricultural experience. While you tour the farm, participants get to participate by feeding animals, milking goats, gathering eggs, and harvesting crops. Aullwood is an environmental education center in Western Ohio. Their goal is to promote the protection of birds, other wildlife and the habitats on which they depend. Aullwood offers both children and adults the opportunity to experience and appreciate the world through experience-based education. Features include woods, streams, ponds, prairies, meadows, and our education center and organic farm. A children’s museum in Dayton which offers a variety of fun activities from play to science. If you have a Cincinnati Museum membership, you are admitted free thanks to their reciprocity program! Situated on a beautiful 65-acre campus between the Great Miami River and a glacial moraine, Carillon Historical Park engages you to sample Dayton’s rich heritage of creativity and invention. The Park immerses you in the region’s history – from Dayton’s founding in 1796 through two centuries of expansion, industrialism and innovation. Learn about these revolutionary achievements while strolling through the Park’s 25 historical buildings and interacting with the hundreds of artifacts in our exhibits. Another beautiful art museum. They offer special programs for children, including an interactive exhibit and special programs. An interactive history park that lets you experience 19th-century American culture through performances, demonstrations, activities, and much more. Another great Children’s museum. With four levels, you could keep busy all day with all the exhibits there are to explore. There is a huge dinosaur exhibit for the young paleontologist. Don’t forget to save some time to ride the historic indoor carousel! A fantastic museum for kids of all ages. Houses a huge play area for children five and under, and offers a wide range of exhibits for kids to adults. If you have a Cincinnati Museum membership, you are admitted free thanks to their reciprocity program! Less than a 10-minute walk from downtown Columbus, on a half-forgotten bend in the Scioto River, lies a fragile green oasis, a tiny jewel, a hidden haven for wildlife and birds set amid an industrial landscape now in transformation. This Audubon Center is one of the first such centers in Audubon’s storied history to bring hands-on conservation and nature-based learning this close to the core of a major American city, a place where thousands of birds migrating from Central and South America use this spot along the Scioto River as a stopover during their long journeys. Glen Helen is a 1,000 acre nature preserve, all accessible from a 25-mile network of footpaths. On even a short walk, visitors can view spectacular wildflowers, 400 year-old trees, limestone cliffs with waterfalls and overhangs, and the beautiful yellow spring for which the town is named. Glen Helen offers educational programs and summer camp opportunities.